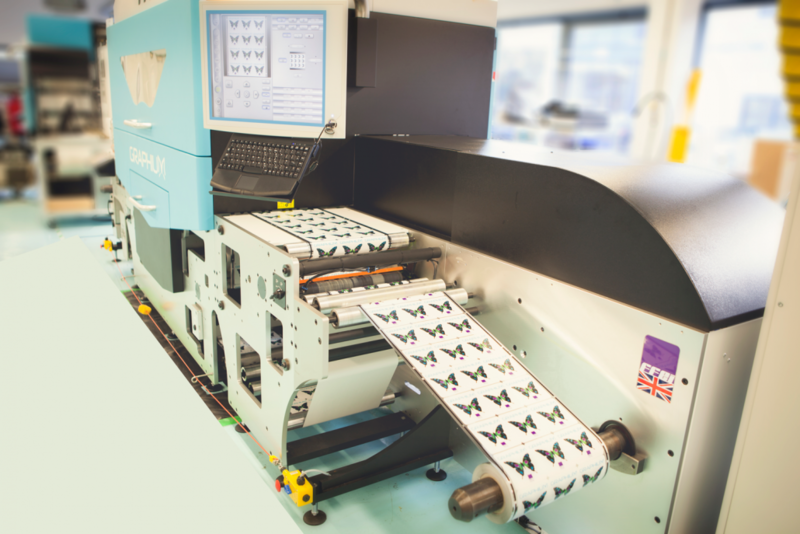 A Graphium hybrid digital inkjet press delivers a cost effective and holistically designed end-to-end label converting solution and has been commercially available since 2013. The Graphium product range combines the expertise of several leading UK based innovators in the market – FFEI Ltd, Xaar, Edale Ltd, and Fujifilm specialist ink systems. Graphium offers market leading print quality, productivity, cost in use and return on investment. This is illustrated by comments from recent installations of the press at Tailored Labels in Wisconsin USA. Graphium has a unique print engine that is capable of printing up to 6 ink colour combinations. You have a choice of 4, 5 or 6 types of UV curable inks including varnish and under or over whites. Graphium can be configured to support substrates up to 430mm and 12-450um (up to 600um as a digital only machine).. The wider platform has a fundamental effect on productivity up to 1134 sqm/h. This results in a minimum of 23% productivity improvement compared to a 330mm press running at similar linear speed of 45-50m/min. Graphium hybrid printing capabilities match any high end flexo platform. Graphium can achieve a full ink and plate change and setup in under 70 secs. When HD flexo is used in combination with digital processes; it keeps setup times extremely short compared to 8-10 colour flexo press. The profitability on a hybrid machine is controlled by the balance of conventional to digital content and thus setup cost to running cost. Graphium’s design, enables print providers to produce ‘fit-for-purpose’ labels, regardless of the application. The versatility the Graphium provides allows printers to optimize production and maximize profit on every job – increasing the profit margin on every label produced. The management of this ‘hybrid’ process is simplified through Graphium Label Workflow, which automates the conversion of 1up PDF designs into the required digital print files and those needed to produce plates and dies, in a totally automated way via existing CAD design libraries (cutters identified by shape matching) or intelligent layout calculations based on JDF rules efficiency and waste. Any variable data solution can be integrated via PDF/VT in full colour. The solution can be scaled across CPU cores and even multiple servers. Graphium Label Workflow provides all the tools for entire re-press process of a Hybrid press yet can also be customised and integrated into any existing automated workflows. Providing optimised images which allow advanced colour management, Grade A barcodes and reproduction of 2.5 pt text on inkjet. Graphium has proven capable of producing self-adhesive labels, unsupported films, cartons, blister hanger cards, shrink sleeve, in mould, tickets, wristbands, air filters, peal & reveal even retail display, product, automotive and marine decals from 1up PDF to finished application ready products.